With each passing day, it seems as though the conversation on Bitcoin’s energy consumption rages on, though new ground is rarely broken on the topic. Like bears to honey, media outlets flock to FUD stories on mining’s electrical costs and doomsday predictions of a world driven to the ecological brink, thanks to bitcoin mining. There is a strong argument to be made, however, that far from plunging the globe into ecological disaster, cryptocurrency mining can be sustainable or, better yet, can be used to neutralize the carbon footprint of other energy intensive processes. Indeed, under the right circumstances, mining can produce a minimal carbon output. Moreover, its energy emissions can be recycled for other eco-friendly endeavors. Bitcoin uses a consensus algorithm known as proof of work to order and timestamp transactions on its blockchain. Basically, miners — those who process transactions — run energy intensive computations on their computers to solve the cryptographic equations that are needed to find new blocks and keep the network secure. As the network attracts more value and miners try to outcompete each other to find the next block, they will invest more energy in solving these equations. Depending on who you’re asking, this process has Bitcoin consuming more energy than a small country (e.g., Bulgaria, North Korea), which could be anywhere from 1 to 35 terawatt-hours per year. Some have argued that innovations like the Lightning Network will scale this problem out of existence, while other critics claim that a proof-of-stake, distributed consensus mechanism could prove to be more ecologically sound. Within this debate, there are those who say this process is unsustainable and needs be fixed. Then there are others who argue that the concern is overblown and nothing needs to change. Hydroelectric power has earned its own place at the crypto conservationist’s table. Chinese mining farms have long drawn cheap surplus energy from hydroelectric dams, especially in the Sichuan province. One of the oldest of these, BW, for instance, helped to pioneer the practice. Founded in 2014, the mining operation has drawn renewable energy to power its rigs since 2015. Though its roots are in China, hydroelectric mining has found its way into other regions that offer cheap river-run energy. In Austria, the Damblon sisters at HydroMiner have looked to harness the output of hydroelectric dams in the alps for their own operation. Nadine and Nicole Damblon founded the HydroMiner Limited Company in 2016 alongside a posse of Viennese miners. By 2017, the team established its first facility in Schönberg, Austria, which draws a base energy output of 290 kWh for its 120 mining units. Their second mining farm in Waidhofen an der Ybbs, Austria, receives a consistent supply of 600 kWh for its 250 Antmine 29s and 1152 GPUs. With the ICO proceeds, HydroMining will look to establish a facility outside of Austria, either in Canada, Georgia or some other country with low-cost, clean energy. According to the Damblons, hydroelectric energy in Austria is 85 percent cheaper than average electricity costs. They can pump energy into their mining rigs for 3-5 cents per kWh, and the Austrian climate is ideal for keeping their hardware cool. When overheating is a problem, they can reroute water from the rivers to keep their system’s from running a fever. Speaking of heating up, the warmth mining rigs produce is ideal for heating a home, especially in colder climates. In the tiny Siberian town of Irkutsk, Russia, Ilya Frolov and Dmitry Tolmachyov are using the heat emitted by their mining rigs to keep their micro home warm. The system heats up a water source connected to the mining hardware, and once warmed, the water is piped to a space heater to keep their abode nice and toasty. Using locally sourced energy from a nearby hydroelectric power plant, the men can warm their home without having to draw any additional energy for heating, and they even get to pocket an additional $430 per month after covering mining costs. One company has taken this concept and run with it. The Qarnot QC-1 streamlines Frolov and Tolmachyov’s design by combining the miner and heating unit into one; it looks like a space heater, runs like a space heater and feels like a space heater, but it’s actually two GPUs with a default to mine Ethereum. There are even more creative and unconventional innovations still: just take a look at the Myera Group, a Canadian sustainability solutions company. At the tailend of 2017, company president Bruce Hardy began using the heat from bitcoin mining to run a sustainable greenhouse and fish farm in Manitoba, Canada. The heat from the miners warms the greenhouse plants, while nitrate-rich wastewater from the fish tanks keeps them watered. In the same vein, NakamotoX, a Czech cryptocurrency exchange, is also using mining heat to grow tomatoes with help from “100% bio-waste produced energy,” according to Kamil Brejcha, the exchange’s founder. In yet another example, NastyMining is an Arizona-based, bitcoin mining organization that harnesses solar and wind energy to run its mining rigs. 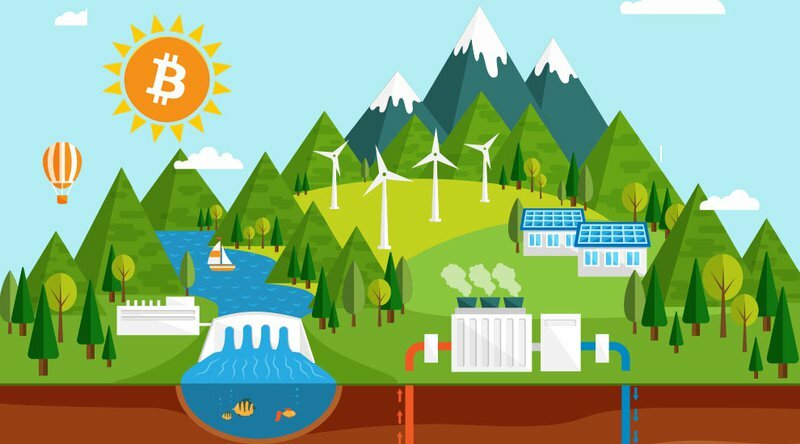 Since 2012, NastyMining has worked to find a middle way for Bitcoin’s energy issues, encouraging “socially responsible” mining from the 30,000 miners contributing to its pool. Since 2017, NastyMining has ramped up its commitment to these sustainable mining practices, utilizing a wind turbine donated by YoBit exchange and a generous donation of solar panels from SunPower solar company to run the ASIC rigs in its facility. The team at NastyMining is part of a wave of miners who have looked to harness natural forces to negate their carbon footprint, and there are more resources than just wind and solar at these innovators’ disposal. Thus, there are innovators who see mining’s weakness as its strength, and they are exploiting the problem as the source of its own solution. These examples are not exhaustive and offer just a sampling of the myriad ways entrepreneurs are challenging the limits of crypto’s mining potential. As more solutions come out of the woodwork, these innovations paint a different picture of what mining can do and what ecological impact it may have on green initiatives going forward.